**Edited 2/5/16 to add a note to Rnds 7, 10, 13, 16, 19, 22. **Edited 2/10/16 Brim section to correct remaining number of loops on each long side of the loom to 34 (68 total). 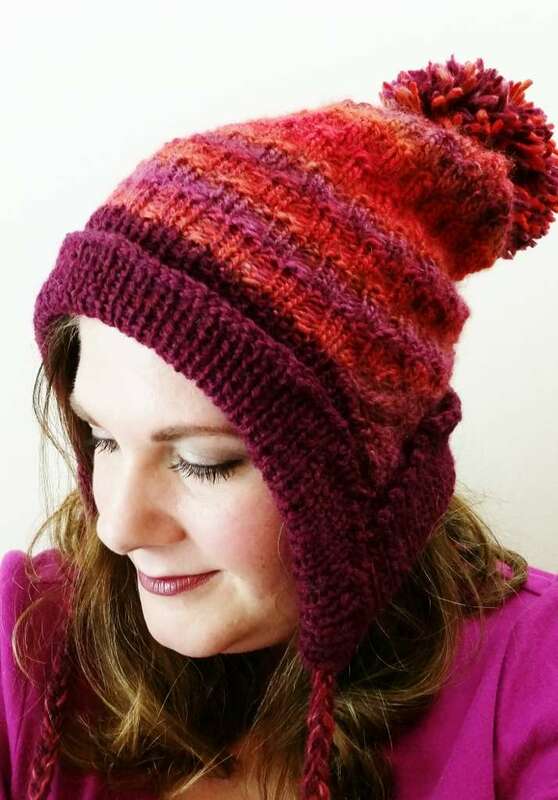 A hat to keep you cozy warm with a vibrantly whimsical flair! This design is unique in that it is styled to be worked from the crown down to create those playful points at the ears. 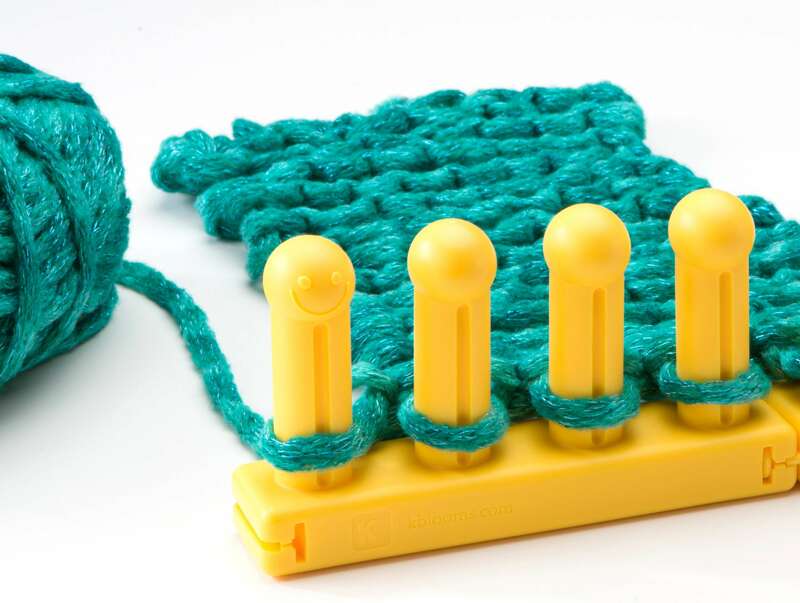 Knitting Loom: All-n-One Loom, 92 pegs used. Yarn: Approximately 395 yards of worsted weight yarn. Sample used Universal Yarn Classic Shades (1 skein in Campfire used for main color) 197 yds/180 m., and Patons Classic Wool Worsted (1 skein in Plum Heather used for contast color) 210 yds/192 m.
Notions: knitting tool, 6mm crochet hook (for cast on and help with possible missed stitches, etc), stitch markers, scissors, knitting pins, yarn needle, row counter. Skills Needed: Knit/U-stitch, Purl, Drawstring CO, Half Hitch CO (or CO of your choice), and Basic BO, braiding and pompom making. 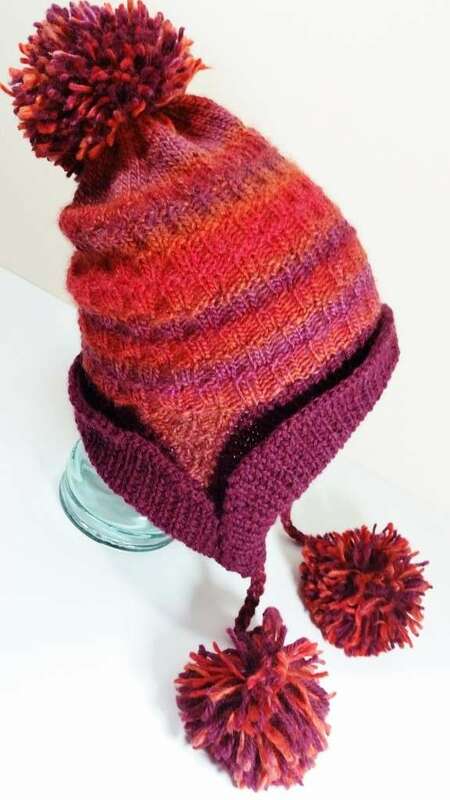 For the sample, all knit stitches were made using the U-stitch. 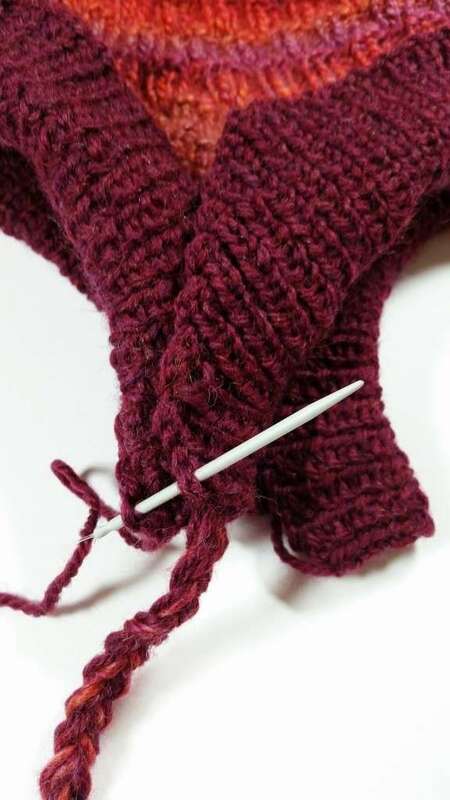 Work whichever type of knit stitch helps you achieve the proper gauge. Set loom to work in the round using 68 pegs, which are centered on the loom. Peg #1 should be at a corner (where the slider and long side meet). Using the Main Color, drawstring cast on to 68 pegs. Rnds 1-6: *k2, p2, rep from * to end of rnd. Rnds 7, 10, 13, 16, 19, 22: (*Note: you will be increasing the number of pegs used by 4, at each corner of the pegs currently being used.) HHCO to corner peg just before peg 1 (this will be the new peg #1), k all pegs on 1st long side of loom to 2nd corner, HHCO to next empty peg, k all pegs on slider, HHCO to next empty peg, k all pegs on 2nd long side of loom to 4th corner, HHCO to next empty peg, k all pegs on slider. Rnds 23-28: *k2, p2, rep from * to end of rnd. Rnds 29-34: * p2, k2, rep from * to end of rnd. Rnds 35-70: rep Rnds 23-34 a total of 3 times. Work the first section of 12 pegs, keeping in the same pattern as before, while decreasing at the center with a k2tog every other row. Expect the decreasing to cause there to be 3 knits or 3 purls together at the center occasionally. When there is only one loop left, cut at 10” for seaming and pull through loop. Repeat procedure with the other side’s 12 pegs. Using the Contrast Color, and leaving a 10” tail for seaming later, CO to 92 pegs, centering them on the loom so that the beginning CO loop is at the center of the front long side of the loom. Work all the way around the loom and back to the 2nd center peg of the front long side of the loom. The original loops of this front long side of the loom will NOT be worked in the following rows. These pegs are simply being borrowed temporarily— just work the rows while ignoring those bottom loops. Only the back long side original loops will be worked into the row. Row 1: s1, *p1, k1, rep from * to back long side with previous sts. Work these sts following the same ribbing pattern, but with 2 loops worked as one (the original loops and the newly CO loops). After these 30 sts are worked, continue around the loom to last 2 sts, k2. Row 2: s1, *k1, p1, rep from * to last st, k1. Row 3: s1, *p1, k1, rep from * to last 2 sts, k2. Rows 4-16: rep Rows 2 & 3. Rows 17-32: rep Rows 2 & 3, but BO the first 2 sts of each row. Loosely Basic BO remaining 60 sts. Leave a 14” tail for seaming. Repeat the same Brim Instructions, but CO starting at the center of the BACK long side, working the original loops from the FRONT long side into the first row. Cinch the Drawstring CO by pulling carefully but firmly on the yarn tail until the sts are as snug as they will go. 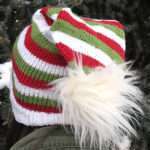 Pull tail to inside of hat and stitch around circle to close completely. Knot securely. 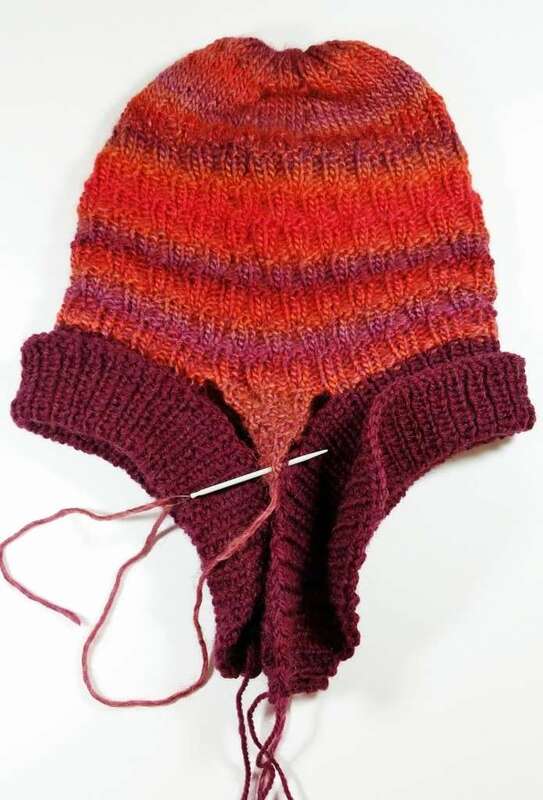 Using the long tails of the MC, neatly stitch the edges of the brim to the MC points on each side of the hat. Create 2 braids by wrapping both the MC and the CC around the loom 6 times. Cut the loops at each end. This will provide 2 sections of 12 strands of yarn. Tie each section with an overhand knot at the top. Divide the sections into 3 groups of 4 strands and braid them together until 4” remain unbraided at the bottom. Secure with another overhand knot. Pinch the top knot of one of the braids between the back side’s brim at the point section. Take the front side’s brim point and wrap around the back side’s to seal the braid inside. Using the long tails of the CC, stitch the braid and corner flaps securely in place, keeping edges even and tidy. Repeat on the other side. 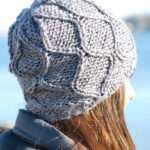 A few hidden stitches can be tucked into the back brim to keep it folded upwards. 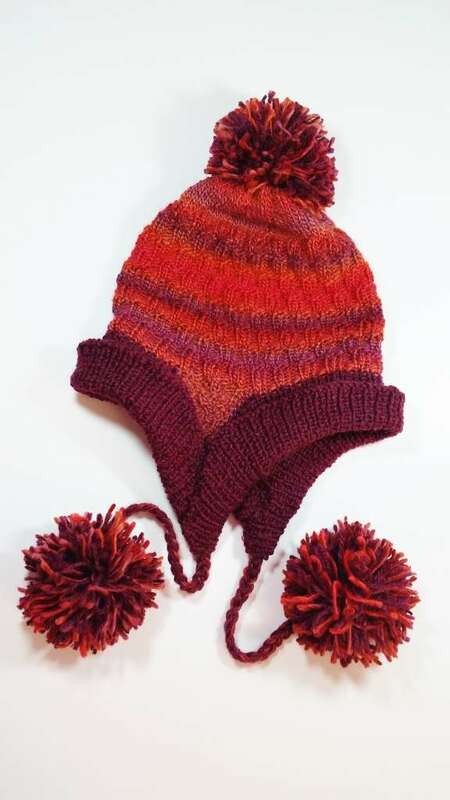 Create three pompoms using both the MC and the CC yarns. Secure onto place at the top of the hat, and at the ends of each braid. The overhand knot at the bottom of the braid serves as a place to tie the pompoms to so that they have a better hold. Can’t wait to get started on this! We are supposed to get up to 14 inches of snow today and tomorrow so I got some great yarn to use! I’m sure I’ll have tons of questions but it looks like an awesome pattern. Thanks! Have fun, Lisa…both with the snow *and* the looming! OK, I’ve done CO and first 6 rows. Struggling with 7. HHCO to just before peg 1 does that mean go all the way around using HHCO? I’m working counterclockwise so maybe that makes a difference?do I need to start over and work clockwise? Told you I would need help! Thanks! Yes, this row was a tad tricky to explain. All you are doing is adding 4 extra pegs, located at each corner of the pegs you are currently using. Thank you! It makes total sense now and I’m on row 12! Love the pattern but I must be missing something. After I finished with the first color and am starting the brim I somehow have 34 loops on each side and not 30. Could you please explain what I am doing wrong. You are exactly correct. Good catch! I have updated the pattern accordingly. Thank you so much for letting me know.